A cold weather system in Europe known as 'The Beast from the East' is taking lives and snarling travel with snow and freezing temperatures. 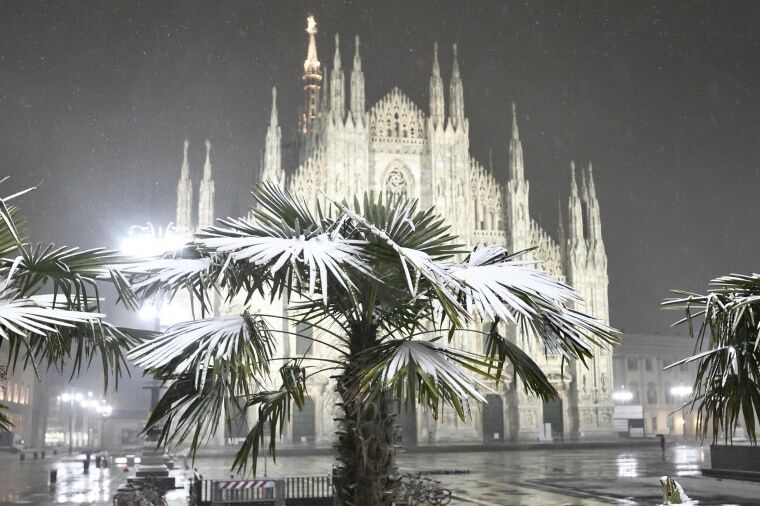 A palm tree is covered in snow in front of the Milan Cathedral on March 1. Cold weather is claiming lives, freezing fountains and harbors and causing snow in areas not normally accustomed to the winter dusting. 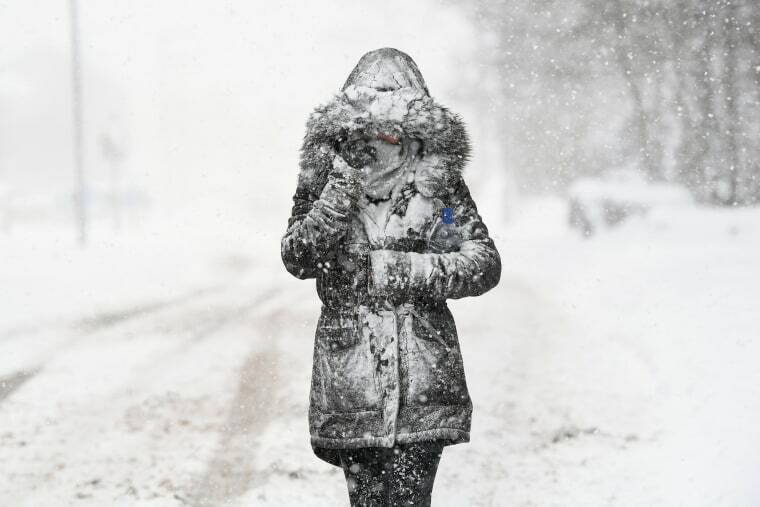 A woman makes her way through falling snow on March 1 in Balloch. 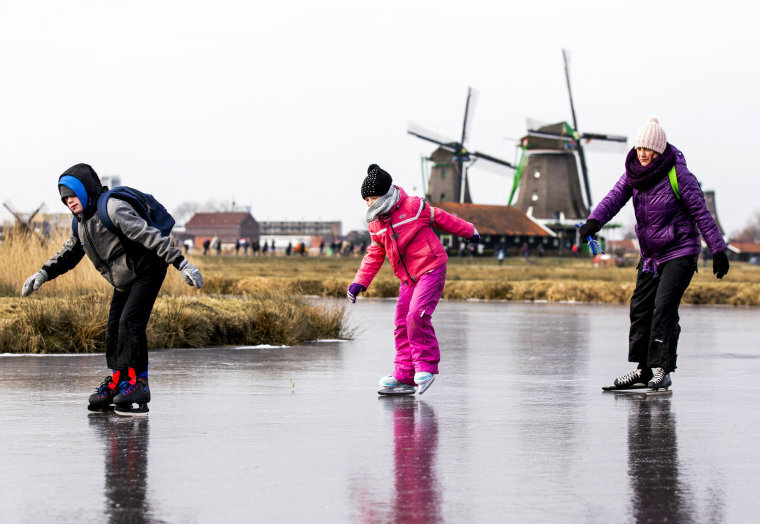 Ice skaters glide on natural ice near Zaandam on March 1. A man rides his snowboard on the Rue du Petit-Chene in Lausanne on March 1. A person walks through now covered streets in Florence on March 1. A dog plays in the snow in the Sempione garden in Milan on March 1. A woman poses in front of the Louvre Pyramid after overnight snowfall on March 1. Snow drifts in fields surrounding the village of Zennor, near St. Ives, on Feb. 28 in Cornwall. Snow-covered jetties on the shore of the frozen Lake Pecs at Orfu on Feb. 28. The sun sets as snow covers fishing boats left at Priest's Cove at Cape Cornwall near Penzance on Feb. 28. Snow covered gondolas on the side of the Grand Canal in Venice lagoon on Feb. 28. A Household Cavalry Guard stands in the blizzard as heavy snow hits Westminster on Feb. 28. Children play in the middle of ice-covered rocks on the frozen shores of Lake Neuchatel on Feb. 28. A postman makes his way through heavy snowfall on Feb. 28. Members of the White Bear Association of Biarritz swim in the Atlantic ocean in southwestern France on Feb. 28. A man walks past snow dusted telephone boxes in London on Feb. 28. Three crew members were rescued by a helicopter after a fishing boat drifted into the Aggersund Bridge in the Limfjord, in the northern part of Jutland, Denmark on Feb. 28. Children slide down a hill on plastic sheeting in Rathfarnham, Dublin City, Ireland on Feb. 28. People walk in the snow in Westminster, London on Feb. 28. Snow-covered field in Grofl Stieten, northern Germany on Feb. 27. A woman walks in front of the snow-covered Puppy sculpture by Jeff Koons during a snowstorm in Bilbao on Feb. 28. The skyscrapers of Canary Wharf rise above a snow covered Greenwich Park in London on Feb. 28. Ice covers the piers of Constance lake harbor in Germany on Feb. 28. Snow covers la Concha beach ornamental railing in San Sebastian, the Basque Country, northern Spain on Feb. 28. A man walks on the partially snow-covered Pyla sand dune in La Teste-de-Buch, southwestern France on Feb. 28.